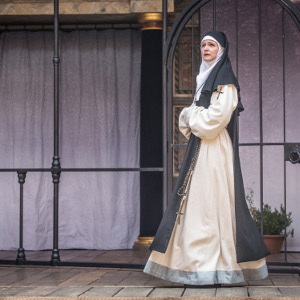 The Heresy of Love is an accomplished play by Helen Edmundson, currently being staged at Shakespeare’s Globe Theatre. With a mixture of historical fact and imaginative detail, Edmundson reveals the fate of a 17th century counterpart: the nun and playwright, Juana Inés de la Cruz. Exceptionally well-read and a talented author, Juana was a favourite at the viceregal Spanish court. She retreated to continue her work behind convent walls, but as a woman, her success was dangerous. The Heresy of Love shows her caught in the power struggles of the Christian church in Mexico. In the shadow of the Spanish Inquisition, she is pursued by an Archbishop with explosive religious zeal and all the raging misogyny of a Men’s Rights Activist. To this extent the play is a clever commentary on religion and the potential extremes of the believer. This dark figure of the plot, the Archbishop Aguiar Y Sejas, accepts “no bartering” when it comes to “the rules” of Christianity. By the end of the play he is burning books, including Sister Juana’s expansive collection. He is ready to replace them with articulations only of his own dogma. But religion is not automatically an oppressor in the play and the Archbishop is not the only religious character. There is also Bishop Santa Cruz – Juana’s temporary ally – who bends whichever way is expedient for his career. It is Santa Cruz that Juana accuses of betraying her; publishing unauthorised her private and controversial thoughts on a sermon. This led to her downfall but also one of her most enduring legacies: her written response. “Private and individual study, who has forbidden that to women?” she writes, over a century before Mary Wollstonecraft and other feminist pioneers. “Like men, do they not have a rational soul? Why then shall they not enjoy the privilege of the enlightenment of letters?” In her response, religion is not her silencer, but the facilitator of her learning. Indeed, between the extremes of the Archbishop and Bishop stands Juana herself, a model of moderate religion whose faith is based on personal reasoning. The Heresy of Love moves beyond stark judgements about the past. It presents complexity and therefore authenticity. This is true of its second main thread: the women obscured by a male-authored history. Rather than simply reverse this fate, by staging Juana’s story, an intelligent script elucidates the ideologies and institutions that pushed it aside. For example, the drama presents with clarity past imbalances of power. As the men compete for more of it, their prohibition on her writing threatens to leave Juana penniless. An illegitimate daughter, lacking inherited or marital wealth, she is reliant on her self-taught literary skills. The play also dramatizes (still persistent) ideas, not only about female education, but about slavery and woman’s ‘natural’ sinfulness. The humanity of the play brings these weighty themes together. All the characters interact on stage, not as caricatures, but as you would expect people to. The men are flawed, but familiar. Meanwhile, Juana herself never feels like either a passive victim or an armoured heroine. The play recognises that women in the past lived and worked with the men that might have oppressed them, and therefore had some scope for personal resistance. Juana argues her case, and resists the rulings of the men around her. Nonetheless, although she cannot remain undamaged from such an assault against her, audiences will be inspired by her determination to defy male plans and decide her own fate. Meanwhile, there are other interesting and memorable personalities to watch. My favourite came from within the convent, where there is a refreshingly authentic representation of female community. Between Juana and her niece Angelica, for example, played by Gwyneth Keyworth, is a protective familial bond, as well as humour and teasing. Part of this family unit is also Juana’s down-to-earth comedic maid, Juanita. She draws out the humour in Angelica’s youthful infatuation with the court flirt, Don Hernando, played by the equally comical Gary Shelford. I might have felt some discomfort at a black actor again being cast in a comedic role for Juanita, but Edmundson further develops the character, with her oppressions as a slave considered, and Sophia Nomvete, who plays Juanita, fills the stage with such exuberance and familial emotion that she wins a large portion of the audience’s love. What makes the play so effective – and will force me to make a return visit – is how well-developed the secondary cast of characters are. The jealous Sister Sebastiana, for example, is implicated in Juana’s tragedy. She is so desperately envious of Juana’s fame that she pretends to have visions. In Edmundson’s play, this seems more than attention-seeking. She appears to crave recognition of her piety and personal validation of her decision to enter a tough religious vocation and sacrifice the luxuries and wealth of marriage. There is also a well-drawn friendship between Juana and a woman on the outside, the Vicereine, who is plagued by miscarriages and the uncertainty of pregnancy. Neither Juana nor the play itself are removed from these female experiences, into a male world of reading and institutionalised religion. It runs throughout the plot. Indeed The Heresy of Love is not about the single extraordinary woman that succeeds or suffers a dramatic fate. It is about a female community and the threads that cement their collective oppression. 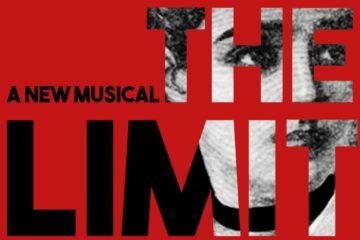 Juana wrote, “One and all wish me to conform to the rules of their judgement; so that from all sides comes such a singular martyrdom as I deem none other has ever experienced.” But the play makes it clear that she was not alone. In the time-appropriate surroundings of The Globe, aided by the familiar language of a modern script, this history becomes unexpectedly tangible. Brilliantly evocative South American music, played live, gently heightens the magical atmosphere inside the theatre. But otherwise, the staging is simple and not culturally specific. This helps make the production accessible to the diverse audience the theatre attracts. 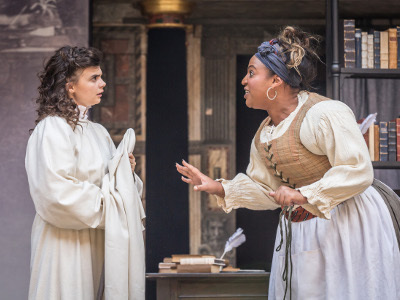 Visiting Shakespeare’s Globe is often pitched as an educative experience, but watching The Heresy of Love will be a truly enjoyable and enthralling one. With comedy, forbidden romance and a rapid spiral into tragedy, it not only offers ideas, but prompts laughter and tears. While The Heresy of Love is playing, a summer’s evening at this historical riverside theatre is a safe-bet for a very good night out. The Heresy of Love is at Shakespeare’s Globe until 5 September. Readers of The F-Word can get tickets for the best available seats for £20 with the code PCDHERE20. The photographs are from the production and are by Marc Brenner. 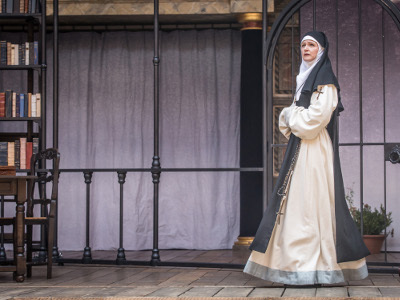 Image 1: A woman in clothing appropriate for a nun in the play’s setting is walking across the stage, looking out. She looks pensive and holds her hands together. To the far left, there are books on bookshelves. Image 2: Two women are talking. The one on the left holds a blanket or shawl and looks concerned or confused; the one of the right is leaning in, animated and holding string or laces. Behind them are books on a bookshelf and a desk with books and a quill on it. 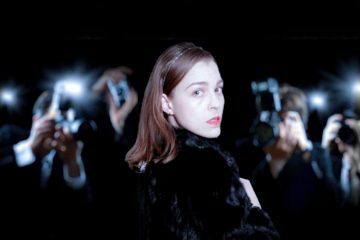 I went to see this with the discount code – it was one of the best things I’ve seen this year! Fantastic writing and it really fitted the Globe well. The cast were absolutely stellar.